The following is a guest post from Tammy Logan of Gippsland Unwrapped. She lives on a farm, is a mother, a passionate eco-warrior and has a degree in conservation biology. After completing Plastic Free July, Tammy realised that she did have a choice about how she lived her life or voted with her dollar. And so, Gippsland Unwrapped was born. It's a blog about living a life that leaves less of an impact on the world. These 1.25L jars will be our garbage bins for 2016. There is one for each member of the family to keep their landfill waste in. That's the stuff that we can't refuse, reduce, reuse, recycle or compost (in that order). The jars will include the waste we generate at home, on holidays, at parties, at work and at school. They will include the things given to us by others that we choose not to refuse. This could get tricky. And they will include the waste from hobbies, pets, gardening and other projects. Hmm, maybe we should be using bigger jars. Over the past six months, we have been able to significantly reduce our landfill and recycling. Our landfill seems to be about the size of one handful per week, but there are some items I need to do more research on, and sometimes I make a discovery or get a tip from someone that solves a problem for me. Our composting has increased due to an increase in fruits and vegetables in our diet, but we work on reducing that too. I am really proud of our efforts, especially as we live in a rural area, and have two children who will be ages seven and five this year. I am also proud of my partner. Initially my choices caused a major upheaval in our lives and I'm sure he was thinking he'd wait out this 'phase'. Now, he is finding alternatives for plastic bags of ice for his beer at parties, and saving his bottle tops for recycling! The next step is to find someone that will refill beer and wine for us. 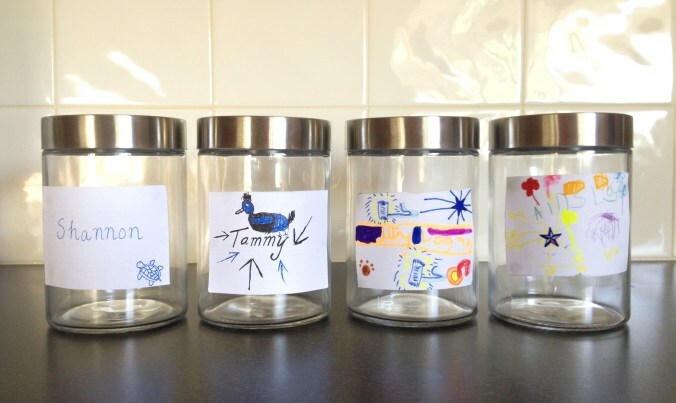 When I introduced the jars, my kids wanted to write their own names on the labels. My eldest drew chocolate bar wrappers to decorate his, and a sea bird on mine. This is a good sign that he is taking ownership of his jar and developing his understanding of our consumption habits on the environment. My youngest decorated hers with flowers and a fairy map. She had some concerns that her jar would be the fullest at the end of the year, so I explained to her that it isn't about winning or losing and that she already makes good decisions to avoid single use plastic, so if she kept trying to make good decisions, she could be proud of her efforts. And that's the point. This exercise is not meant to be a stressful challenge that we pass or fail. It is an exercise to educate ourselves and others about consumption and waste. The jars are a great visual tool, especially for our children, to monitor progress and celebrate efforts. Knowing what's in our bin means we can pinpoint areas to work on and identify significant influencers. This will be different for each member of our family. The exercise has the potential to facilitate discussions about our lifestyle with influencers and others outside our immediate sphere e.g. school teachers, workplaces, and relatives. Having our own jars provides an incentive to try to do well, and encourages accountability for individual contributions to our household waste. It can open up a dialogue about options for improvement and even accepting that none of us are perfect all the time (at anything). My motto is that practice makes permanent, not perfect. As a parent I want to raise thinkers and decision makers. This doesn't involve me telling them what to do or doing it for them. It means letting them make their own decisions and letting them deal with the consequences of those decisions, good or bad. Encouraging them to take responsibility for their waste by putting it into their jars gives them lots of opportunity to practice making good choices. It might mean we have more landfill than I'd like in 2016, but my hope is that the long-term benefits of this approach will be significant for my children and the environment. My children will learn about standing up for what you believe in. I believe this exercise will encourage creativity and resourcefulness in all of us. These are very important skills to bring to all aspects of our lives. We will learn more about the environmental, social and economic impacts of the things we consume: the resources that go into them, how they are made, the conditions of workers, the ability to be recycled or composted, and what happens to the environment if they are not. Being informed means we can vote appropriately with our dollar. Our efforts will mean less harm to the environment and a healthy home. Whatever the volume of landfill at the end of the year, I am confident we will have tried our best, made a difference, learnt a lot, and functioned as team. What are your plans for reducing waste in 2016?